Introduction Medical treatment, cerebrospinal fluid (CSF) shunting, and optic nerve sheath fenestration are standard treatments for increased intracranial pressure (ICP) in patients with idiopathic intracranial hypertension (IIH). Venous sinus stenting provides a novel alternative surgical treatment in cases of venous sinus stenosis with elevated ICP. Methods 12 consecutive subjects with papilledema, increased ICP, and radiological signs of dural sinus stenosis underwent cerebral venography and manometry. All subjects had papilledema and demonstrated radiological evidence of dural venous sinus stenosis. Results Six subjects chose venous stenting (Group A) and six declined and were managed conservatively with oral acetazolamide (Group B). The relative pressure gradient across the venous narrowing was 29±16.3 mm Hg in Group A and 17.6±9.3 mm Hg in Group B (p=0.09). The mean lumbar puncture opening pressure was 40.4±7.6 cm H2O in Group A and 35.6±10.6 cm H2O in Group B (p=0.4). Spectral domain optical coherence tomography (SD-OCT) showed mean average retinal nerve fiber layer (RNFL) thickness of 210±44.8 µm in Group A and 235±124.7 µm in Group B. However, the mean average RNFL thickness at 6 months was 85±9 µm in Group A and 95±24 µm in Group B (p=0.6). The total duration of acetazolamide treatment was 188±209 days in Group A compared with 571±544 days in Group B (p=0.07). 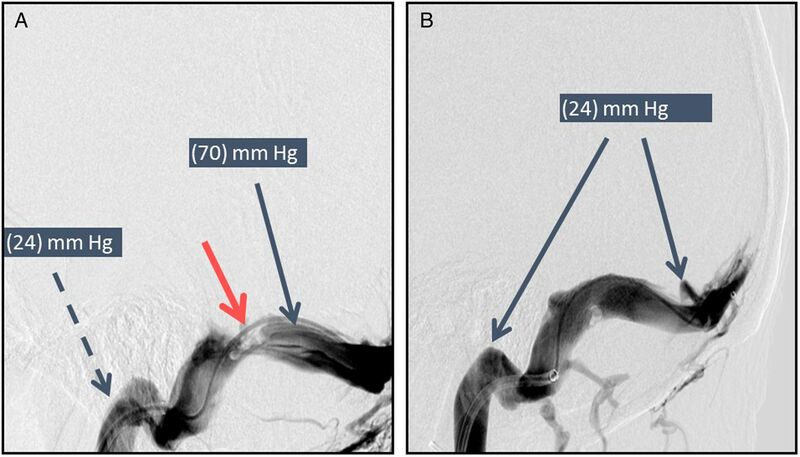 Conclusions In subjects with venous sinuses stenosis, endovascular stenting offers an effective treatment option for intracranial hypertension which may shorten the duration of medical therapy. Conventional treatments target treating the headache and preventing permanent vision loss. Medical treatments, primarily carbonic anhydrase inhibitors such as acetazolamide and topiramate are frequently used. Anatomic abnormalities of the cerebral venous sinuses have been identified in a number of subjects with IIH. Whether the finding of venous sinus stenosis is the actual cause or the result of elevated ICP remains largely controversial. Venous sinus stenting has emerged in recent years as an alternative treatment modality in such subjects.19 The goal of this study is to evaluate venous sinus stenting in comparison with medical treatment for treatment of papilledema secondary to elevated ICP associated with venous sinus stenosis. This study adhered to the tenets of the Declaration of Helsinki and was compliant with the Health Insurance Portability and Accountability Act. Institutional Review Board approval at University of Pittsburgh was obtained. This work is a retrospective chart review of subjects who presented to our institution between August 2013 and May 2014 with the following criteria: (1) papilledema confirmed by a dilated fundoscopic examination by an ophthalmologist; (2) elevated ICP, confirmed by a lumbar puncture (LP) opening pressure of >25 cm H2O with bland CSF constituents; (3) presence of radiological signs of dural venous sinus stenosis on non-invasive neurovascular imaging, either magnetic resonance venography or CT venography; (4) otherwise normal MRI; (5) a pressure gradient of ≥8 mm Hg measured across the dural sinus stenosis via manometry through a direct retrograde cerebral venography. All subjects were offered venous sinus stenting as a treatment option for their elevated ICP. Demographic features (age, gender, body mass index (BMI)), neuroimaging findings, CSF opening pressures, CSF analysis, neuro-ophthalmologic clinical evaluation, best corrected visual acuity (BCVA), color vision, pupillary examination, retinal nerve fiber layer (RNFL) thickness measured by spectral domain optical coherence tomography (SD-OCT), visual field testing parameters such as mean deviation (MD) and pattern SD, procedural details of the cerebral angiography, and clinical outcomes were obtained by retrospective chart review. Cerebral venography was performed under local anesthesia. After transfemoral venous access was obtained, a 6 Fr Neuron Max guide catheter (Penumbra) was advanced into the right jugular bulb. A microcatheter (Marksman, Medtronic) and 0.014 inch microwire (Synchro-2, Boston Scientific) were navigated into the dural venous sinuses. The microwire was removed and a standard arterial pressure transducer was calibrated and connected to the microcatheter. Manometry was attempted in the following locations: superior sagittal sinus; proximal and distal transverse and sigmoid sinuses; bilateral internal jugular bulbs. A difference of ≥8 mm Hg across the stenosed segment was required to proceed with stenting. Subjects who opted to undergo venous sinus stenting where labeled Group A while subjects who declined the stenting and were managed conservatively with acetazolamide and close outpatient monitoring were called Group B. An appropriately sized stent (8–10 mm diameter, 30–40 mm length) was placed across the stenosis in six subjects. If the stenosis was bilateral, the stent was placed in the dominant side with the higher pressure gradient. The pressure gradient after stenting was confirmed to be zero in all cases. Ipsilateral common carotid artery angiography was performed to ensure no delay or abnormal stasis of the superficial or deep venous drainage. Subjects were observed for 24 hours in a neurological intensive care unit and 24 hours in the stepdown unit. All subjects were premedicated with aspirin 325 mg/day and clopidogrel 75 mg/day for 7 days prior to the venogram; clopidogrel was continued for at least 3–6 months after the procedure in Group A.
Pre- and post-stent data were compared using the paired t-test. The differences between Groups A and B were compared using the independent sample t-test. Statistical significance was considered at p values of ≤0.05. However, the Bonferroni correction was applied to compensate for multiple comparisons. The Bonferroni-adjusted p value was computed to be 0.003. Twelve subjects were included. Six subjects opted to undergo venous stenting (Group A) while six subjects declined the stenting and were managed conservatively with acetazolamide and close outpatient monitoring (Group B). The mean age for Group A (all women) was 32 years (range 18–47) compared with 30.6 years (range 23–40) for Group B (5 women, 1 man). Mean BMI at the time of presentation was 39 kg/m2 (range 32.8–43.1) in Group A and 36.2 kg/m2 (range 25.7–50.6) in Group B (see table 1). Twenty-four eyes of 12 subjects were analyzed. Mean BCVA at presentation in Group A was 20/25 (range 20/20–20/50), while BCVA of Group B was 20/23 (range 20/20–20/30). The mean Ishihara color plate score was 97% correct (range 86–100%) for Group A and 100% in Group B. Dilated fundus examination revealed papilledema in both eyes of all subjects. Automated perimetry using the 30–2 protocol Humphrey visual field (HVF) demonstrated a mean baseline MD of −6.9 dB (range +1.00 dB to −20.2 dB) in Group A and −10.2 dB (range +1.00 dB to −20.1 dB) in Group B. SD-OCT showed mean average RNFL thickness of 210±44.8 µm in Group A and 235 µm±124.7 µm in Group B. The mean CSF pressure on LP ranged from 26.5 to 55 cm H2O (37.7±9.3 cm H2O) with normal composition in all subjects. The mean LP opening pressure was 40.4±7.6 cm H2O in Group A and 35.6±10.6 cm H2O in Group B (p=0.4). The average venous pressure at the distal segment of the stenosis was 40.5±11.9 mm Hg in Group A and 26.3±6 mm Hg in Group B. The average pressure gradient across the venous stenotic segment was found to be 29±16.3 mm Hg in Group A compared with 17.6±9.3 mm Hg in Group B (p=0.09). Three subjects received Zilver (Cook Medical, Bloomington, Indiana, USA) stents and three received Precise stents (Cordis Corporation, New Brunswick, New Jersey, USA) (figure 1). All subjects who underwent venous sinus stenting remained on clopidogrel for 3–6 months at the dose of 75 mg once daily. (A) Catheter-based venography showing transverse sinus stenosis. A pressure transducer measured a pressure of 70 mm Hg in the transverse sinus (solid thin arrow) proximal to the area of the stenosis (thick arrow) compared with a pressure of 24 mm Hg distal to the stenosis (dashed arrow). (B) Following stent placement, the pressure was 24 mm Hg proximal and distal to the stented segment of the previously noted stenosis. All subjects received short-acting oral acetazolamide. The investigators were not masked as to whether or not the patients were stented. The dose was titrated according to the subject symptoms of headaches and transient visual obscurations as well as the optic nerve appearance and HVF performance. The mean acetazolamide dosage at 2–6 weeks was 1500 ±918 mg/day in Group A and 1083±1357 mg/day in Group B (p=0.5), at 3 months the mean acetazolamide dosage was 1450±670 mg/day in Group A and 562±718 mg/day in Group B (p=0.1) (table 2), and at 6 months the mean acetazolamide dosage was 1625±478 mg/day in Group A and 750±1500 mg/day in group B, with no statistically significant difference (p=0.31). The total duration of acetazolamide treatment was 188±209 days in Group A compared with 571±544 days in Group B (p=0.07). At 6 months the mean BMI was 40.3 kg/m2 in Group A and 36.1 kg/m2 in Group B, with no statistically significant change from baseline in either group (p=0.5). Mean BCVA at 3 months in Group A was 20/28 (range 20/20–20/60), while BCVA of Group B was 20/23 (range 20/20–20/30). Mean BCVA at 6 months in Group A was 20/27 compared with 20/24 in Group B. HVFs at 3 months demonstrated a mean MD of −7.5±7.35 dB in Group A and −3.8±3.2 in Group B. The mean MD improved at 6 months to −6.9±9.1 in Group A and −2.4±0.9 in Group B. The range of MD improvement in Group A was +3.7 to −3 compared with +11 to −5 in Group B. SD-OCT showed a mean average RNFL thickness at 3 months of 210±162 µm in Group A and 235±72 µm in Group B (p=0.7) (figure 2). The mean average RNFL thickness at 6 months was 85±9 µm in Group A and 95±24 µm in Group B (p=0.6). (A, B) Bilateral severe papilledema with cotton wool spots and disk hemorrhages at the time of presentation. (C) Baseline Humphrey visual field testing shows a more severe degree of concentric peripheral vision loss in the left eye than in the right eye. (D) Six months after stenting a remarkable improvement of both visual fields is noted with greater residual field loss in the left eye than in the right eye. No intraoperative or immediate postoperative complications were reported secondary to angiography or stenting. There were no complications to clopidogrel or acetazolamide therapy in this series. One subject in Group B presented with worsening central acuity as well as color vision, visual field MD and a new afferent pupillary defect 3 months after stenting despite the normal ICP by repeat LP. This was the only subject who underwent repeat LP in this study. The subject underwent ONSF with no improvement in vision postoperatively. Venous sinus stenting has been proposed as a surgical treatment modality for subjects with elevated ICP with signs of sinus stenosis. However, this relatively new surgical option is not free of complications. The most common complication is recurrence of stenosis immediately proximal to the stent. Other complications include stent migration, in-stent thrombosis and, most concerning, intracranial hemorrhage.21 ,24 Dinkin et al24 reported visual field improvement in patients with refractory IIH and fulminant visual loss following stenting. In his study, visual field improvement was more remarkable than the one reported in our study. This may be due to the small samples in each study and the fact that a different visual field protocol was used (24–2 in Dinkin's study vs 30–2 in our study). Despite the lack of randomization, the baseline demographics and subject characteristics were comparable in this study without a significant difference between Group A and Group B. There was a trend for a higher dural sinus pressure gradient in the stented group compared with the medical management group. This may reflect a degree of self-selection bias. The majority of eyes in our series demonstrated a reduction in the severity of papilledema within weeks of stent placement. All subjects showed consistent improvement in visual field MD, except for one subject who continued to lose peripheral vision and eventually central vision despite normal opening pressure on LP and stent patency. The vision loss did not improve after increasing the subject's acetazolamide dosage and performing ONSF. Although medical management in the form of oral acetazolamide was used in both groups, the subjects in the stenting group required a much shorter treatment period. Although the difference was clinically significant (188±209 days in the stenting group vs 571±544 days in the medical management group), the difference did not reach statistical significance due to the small sample size (p=0.07). Shortening the duration of acetazolamide therapy may favorably improve compliance and decrease the number and severity of side effects, particularly more severe sequelae such as renal stone formation. Shortening the duration of medical treatment, especially in patients who poorly tolerate acetazolamide therapy, may save these patients unnecessary surgery such as CSF shunting and ONSF. The safety profile of the minimally invasive venous sinus stenting is favorable compared with CSF shunting and ONSF. SD-OCT at presentation demonstrated RNFL swelling in all subjects in both groups. Our study showed a reduction in average RNFL in all eyes with thickened RNFL at presentation to the normal range in both groups, except for one subject who continued to lose vision. This subject did demonstrate focal superior and inferior RNFL thinning at 6 months (77/76 µm). Overall, our data showed an improvement in HVFs in both study arms. We recognize several limitations in this pilot study. The non-randomized retrospective nature of the study makes it difficult to properly match the cases and controls. It also translates into some variability in the technical aspects of angiography, stenting, stenting material used, and medical management. Self-selection of the subjects into one of the two groups by seeking or declining stenting may indicate some confounding differences between the two study groups, such as compliance with medications and follow-up, general health, intolerance to medications, or more severe presentations in the stenting group. Weight loss does not appear to have confounded the results because, despite extensive counseling, the majority of subjects either maintained weight or even gained weight. Although this study is one of only a few that used SD-OCT data to quantify papilledema, it should be made clear that, given the degree of RNFL edema, it was common to see algorithm failure of RNFL segmentation at baseline evaluation as the RNFL thickness of many of the subjects exceeded the virtual limit at which OCT is thought to be accurate. Furthermore, decreased RNFL thickness may indicated resolution of papilledema, optic nerve atrophy, or a combination of both. Finally, longer follow-up is needed to address the long-term efficacy of this procedure. Our study, as well as other previous studies, supports the notion that a reduction in venous sinus stenosis and venous pressure results in reduction of elevated ICP symptoms and papilledema. Additionally, the procedure of venous sinus stenting appears to be have a favorable safety profile. In subjects with venous sinus stenosis and an appropriate pressure gradient across the segment of dural sinus stenosis, venous sinus stenting provides another viable treatment option with a trend towards shorter duration of medical treatment with acetazolamide. A large multicenter randomized physician-blinded head-to-head trial comparing venous stenting with shunting is needed to determine the relative safety and efficacy of venous sinus stenting compared with optic nerve sheath fenestration and CSF shunting.
. The incidence of pseudotumor cerebri: population studies in Iowa and Louisiana. Arch Neurol 1988;45:875–7.
. Idiopathic intracranial hypertension (pseudotumor cerebri). 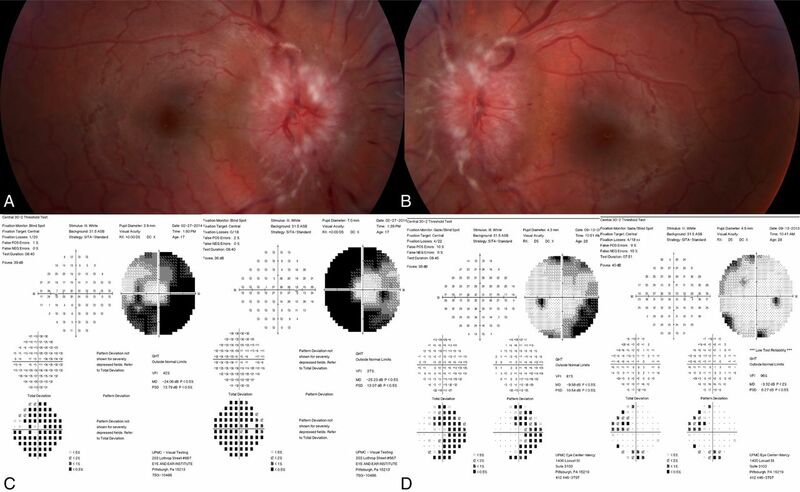 Curr Opin Ophthalmol 2008;19;445–53.
. Asymmetric papilledema in idiopathic intracranial hypertension: prospective interocular comparison of sensory visual function. Invest Ophthalmol Vis Sci 1998;39:134–42.
. Assessment of visual function in idiopathic intracranial hypertension: a prospective study. Eye 1998;12:111–18.
. Idiopathic intracranial hypertension: a prospective study of 50 subjects Brain 1991;114:155–80.
. Idiopathic intracranial hypertension: the association between weight loss and the requirement for systemic treatment. BMC Ophthalmol 2007;25:342–4.
. Reversibility of venous sinus obstruction in idiopathic intracranial hypertension. AJNR Am J Neuroradiol 2007;28:656–9.
. Venous sinus stenting in idiopathic intracranial hypertension: results of a prospective trial. J Neuroophthalmol 2016;27:E14. Contributors TAS performed the data collection for the manuscript, cleaned and analyzed the data, and drafted the paper. APJ, AA, AFD, BTJ, TGJ and GRB reviewed and revised the manuscript. Competing interests TGJ received a grant (non-financial) from Fundació Ictus Malaltia Vascular and honoraria from Silk Road (consultant), Medtronic and Stryker Neurovascular (consultant/advisory board), and J&J and Neuravi (consultant). Ethics approval Ethics approval was obtained from University of Pittsburgh Institutional Review Board.